Spacious side pouches are large enough to carry a full-size set-up board. Heavy-duty zippers provide quick and easy access. Another large zippered side pouch may be used to carry additional set-up equipment or documentation. You can never have too much storage space, and this carrying bag has it in abundance. Strong nylon carrying straps with strong padded handle allow for easy, comfortable carrying. Four heavy-duty rubber feet protect the bottom of the bag from wear and provide sure grip on slippery surfaces. The spacious 500x250x420mm interior is easily accessible through the zippered bag end. There is interior room for different combinations of different-sized storage boxes for carrying any type of RC gear (including your car). The bag comes standard with 1 large + 3 small storage boxes, or optionally 3 large storage boxes may be used. The strong, reinforced, waterproof storage boxes are made from a special high-quality rigid composite material for long life and extra durability. 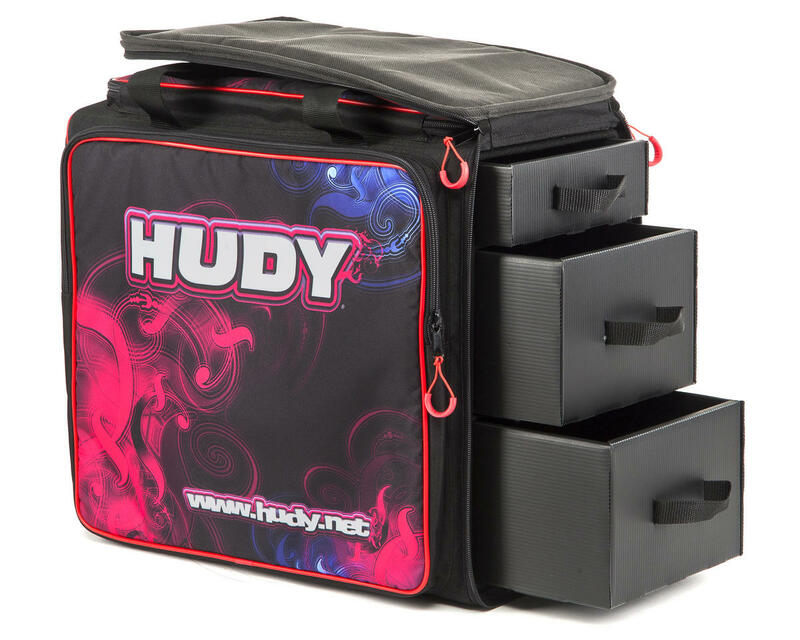 Smart, stylish and distinctive light and ultra-versatile HUDY Team Carrying Bag. 1 large + 3 small storage boxes included made from strong, reinforced, waterproof material. 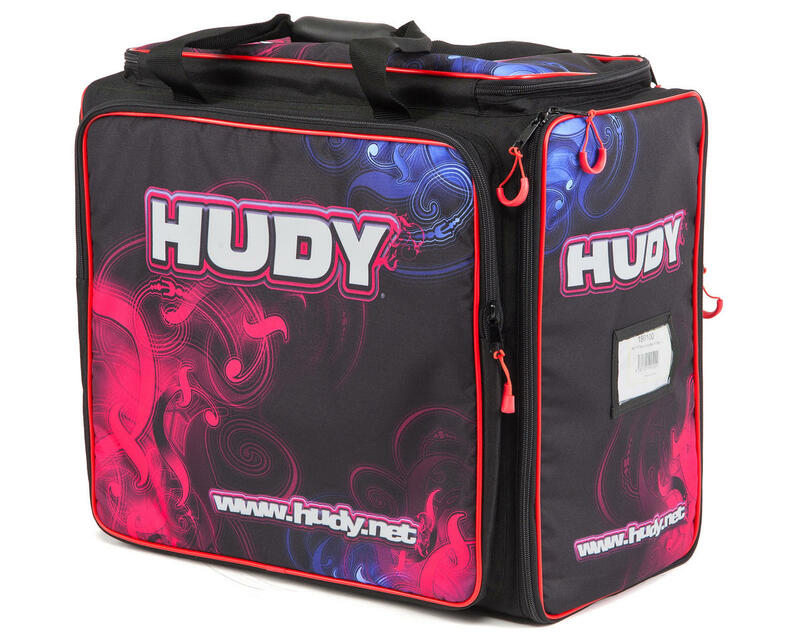 I had absolute trust in the quality of Hudy's products but for this one, I should say a disappointment. The boxes are basically cardboard boxes and not very durable. They were not made as drawers so you'd have to take out each box to pull something out of it. When you put different things in the same box, it's not really an option to label them. So taking out boxes everytime you need something is a big hassle. Well you can spread out the boxes on the floor/ground but not pretty... And a set of wheels and carrying handle would've been nicer. The tool tray on top is decent and could be very convenient. There are 2 big side pockets w/o any compartments. Put your manuals, laptops and maybe setup/tool bags or something flat. Got this bag today. Big kudos to amain for having this in stock. The only US based store that carries them in stock without waiting for months to arrive from international vendors. For the review.... The bag is very stylish and you will for sure arrive at the track in style. Material is good and was solidly made. The only thing negative for me was the size. It contains 2 large drawers and 1 small drawer. The large drawer will fit your 1/10 touring car (perfectly fitted). But if you have a lot of stufg to haul, maybe this is not for you. I dont have much just the basic stuff and i'm of space already. It depends on what is important to you. Haul in style or fitting everything you want to haul. I have had this bag in the past. The old version of this bag had 3 boxes that came completely out of the bag and was pretty annoying this newer version has 3 drawers instead which is a huge step up. It also has a zippable compartment on top with a removable tool holder which is really nice. The bag is really stylish and well made using quality material, someone else made a comment about the drawers being made of cardboard style plastic but that is how all of the bags are made since it's light weight. The only real cons about this bag is it is small compared to most hauler bags and doesn't seem to have many compartments but I think they designed it to be simplistic and compact ...Europeans! :) I don't mind since it helps me be smart about what I pack and is easy to carry. I would recommend this to anyone who wants a great stylish rc bag but if you are looking for a huge rc hauler I would go with the protek or racers edge bag. poor quality metals with the use of scarce, the caster is very poor quality, so they can not drag a bulky bag.